Why it seems so few residents of Bloomington (myself included, until meeting Friesel) are familiar with Edwin Fulwider’s work is what makes the memoir a peculiar object — which isn’t necessarily to say uncommon. Living in Bloomington, one often makes contact with local ephemera — artwork, tapes, zines, books — that may be important, poignant, and beautiful for a time, before disappearing. It can be, at once, odd and totally unremarkable to see an object or a person flirting so closely with obsolescence. Though perhaps, as Friesel points out, it is striking when a person who became and remains quite esteemed in the art world is largely forgotten by his hometown. 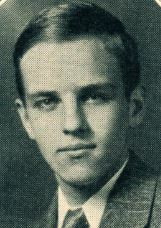 Edwin Fulwider was born in 1913 and grew up in what is now Bloomington’s Prospect Hill neighborhood. After studying at the John Herron School of Art in Indianapolis, Fulwider taught at the Cornish School of Allied Arts in Seattle. 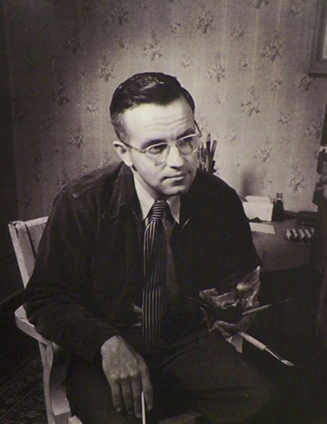 He worked alongside many important modern-regionalist painters of the time, including Thomas Hart Benton, while Benton was painting The Indiana Murals for the 1933 Chicago’s World Fair, and Henrik Mayer, Fulwider’s college mentor. In 1939, his painting Dead Head showed at the San Francisco World’s Fair, and, shortly after, the work was published in Life Magazine. He also worked as an instructor, professor, and eventually chairman of the Department of Art at Miami University in Oxford, Ohio. 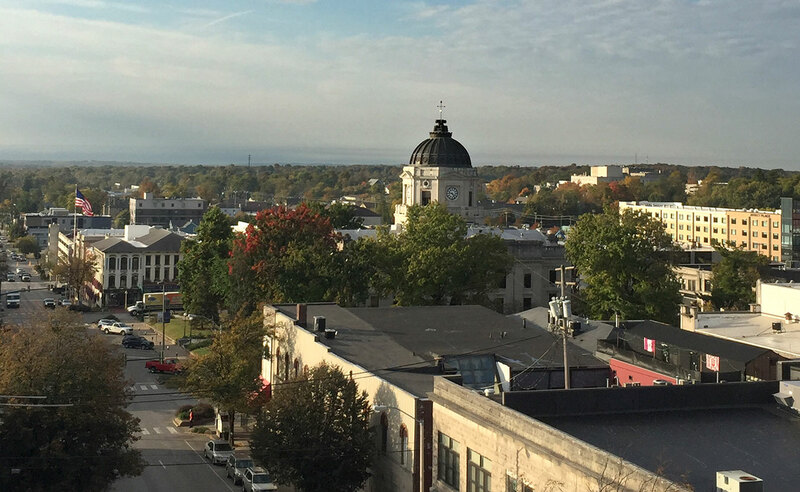 Fulwider’s memoir, which was inspired after an impromptu visit to his hometown in 1986, explores his adolescence in Bloomington during the interwar period nearly one hundred years ago. Edwin Fulwider grew up with his two brothers, Bill and Lawrence, in a house on the southwest corner of West 3rd and South Jackson streets. 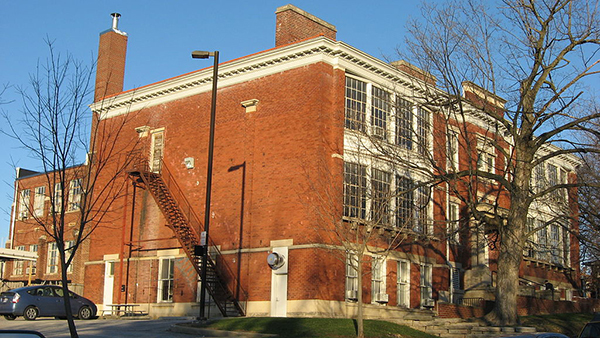 His father owned and operated the Fulwider Lumber Company, which once stretched a full city block south of 3rd Street between South Madison Street and the Monon Railroad (the block was most recently home to High Speed Tire). His mother was a homemaker with whom Edwin shared a fraught relationship. Fulwider spends much of his childhood exploring his father’s lumberyard and mills. His memories of the company provide epoch-marking details of a booming late-industrial era — giant steam boilers, horse-drawn carts, a large workforce of skilled craftsmen — just prior to the Great Depression. At a young age, Fulwider fostered interests in art, architecture, travel, and trains — unusual pastimes for a boy at the time. He became particularly enamored with the rail system, memorizing the trains’ schedules and timing their interval stops as they crossed through town, especially while he was bored in class. There’s a chapter dedicated to a shopping trip to Indianapolis he took with his mother and grandmother on a passenger train, as well as a detailed depiction of the scenery along the way. He also spent much of his time drafting and building furniture for himself in the family lumber mill. Recognizing this early faculty, Fulwider’s father helped Edwin earn a summer apprenticeship with the drafting office at the Shawnee Stone Company, a massive limestone mill between West 7th and 11th streets on North Rogers. (Shawnee eventually merged with Central Oolitic Stone Company; the location is currently home to Bloomington Iron & Metal, where remnants of the mill can still be seen along the B-Line Trail.) 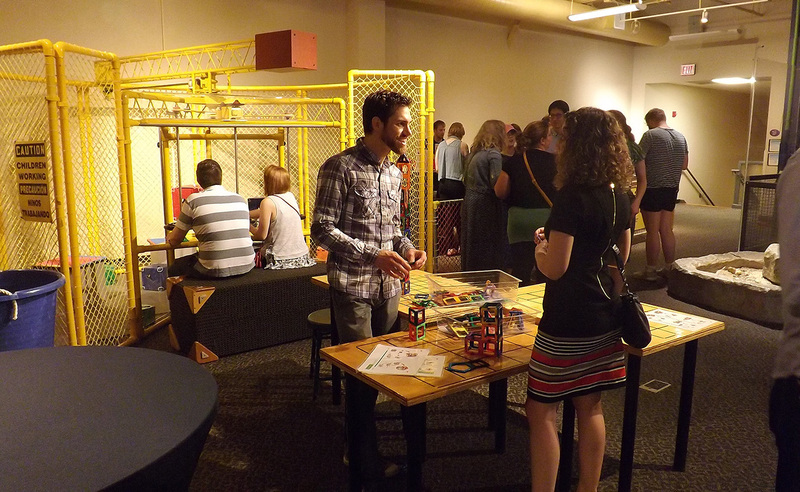 That summer of 1930, Fulwider says the company had three important contracts: The Gulf Oil Building in Pittsburg, The Bell Telephone Building in Nashville, Tennessee, and the Museum of Science and Industry in Chicago. Central was an example of pure Victorian Architecture of the finest kind, with all the features of a Mansard roof high above the three stories, with those wonderful ornate dormers much like on the Tinker Mansion, and a classic tower with a Mansard top which commanded a view of all Monroe County. This colossus … backed up to the Monon Railroad and was directly across the tracks from father’s lumber yard. … I have used it thousands of times in my paintings. It can be seen sticking up in backgrounds in almost all of my victorian towns and skylines. My appreciation of Architecture, even before I knew it was “Architecture,” and my interest in the railroad so far transcended anything I could possibly get out of school that it made me a misfit. Molly [Carr] reined supreme in a room on the back side, second floor, affording a clear and beautiful view of the Monon and all the great trains that chugged up the one percent grade through town. Oh, what magnificent sights, those trains with their 2-8-4 locomotives fresh from Baldwin and a heroic Casey Jones at the throttle with his arm resting on the window sill, a foot proped up on the boiler head and a cigarette in his mouth. This was my downfall. Though Fulwider forged his own niche in Bloomington, he describes himself as a lonely outlier in a city he often found dull and unsophisticated. In one particular chapter, “The Band Concert,” Fulwider remembers parking downtown every Saturday evening with his family to watch a large brass band play on the courthouse lawn. He ridicules the bandleader for having no sense of aesthetics or knowledge of music history. However, the band had a unique place in the social structure of the town. The weekly free concert on the Courthouse lawn drew record crowds. Unlike many towns, ours had no bandstand but rather a high bank on the south side of the Courthouse yard, with a bank of steps leading down to the street which provided an ideal place for the band to perform. This arrangement put the band several steps above the audience who occupied the sidewalk or street, in parked cars or folding chairs provided by the people themselves, or in some cases by the local mortician. In our small college town there was a constant bickering between the town and gown. The citizens of the town were at odds with the intellectuals at the university. The townspeople did not understand professors who lived in the clouds away from reality, living off the taxpayers and for what good? And anyway, the college was getting too big, nearly two thousand students. Anyone knows it is impossible to educate that many people at one time. The whole thing should be closed down and the land turned back to tillage. From this limited atmosphere, Esther Beck disappeared. In the spring of 1937, Katy became pregnant with their first child. Fulwider found employment in Indianapolis and, according to his memoir, began renting a studio at the corner of 6th and Walnut (above what is now the restaurant Samira), before losing his job and moving in with his mother directly after the birth of their child. City records indicate that Fulwider began renting the house on West 15th Street in 1938 (though he says 1937 in the memoir), and that he and Katy were still living with his mother at 302 E. 7th St. during Katy’s pregnancy and the birth. He seemed to savor his independence, as he quickly glosses over living with his mother, and remarking once that he took pride in renting the house on West 15th Street, which was notoriously “on the wrong side of the tracks,” both literally and figuratively. The memoir ends suddenly in the close of that year: On Sunday, December 26, the day after Christmas, Katy had their first child, Edwin Jr., in a hospital in Indianapolis. On Monday, the day after their son’s birth, Edwin writes that he was laid off from work. No matter the tumultuous end of Edwin Fulwider’s life in Bloomington, we can gather from his paintings that his head remained “full of trains.” The artwork he would go on to make articulates railroads, train stations, and city structures of the American Midwest and Mid-Atlantic, in the style of his fellow modern-regionalist artists: abstracted imagery, bright blocks and smears of primary colors, and a certain fascination with subjects of modern technology and American primitivism. 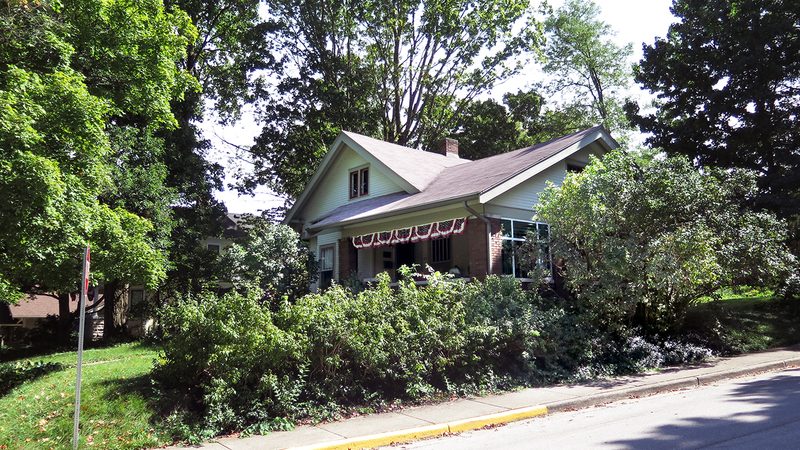 In a rare visit, Fulwider briefly returned to Bloomington in 1986 and writes that he is satisfied to see his family’s former homes still relatively unchanged and in good repair, and is aggrieved by the absence of the great lumberyard and Shawnee Stone Company. He writes in the foreword: “This is the subject of this narrative, a revisit into a past that can never happen again. … The world has changed, and this way of life is gone forever. It is recorded here more as a curiosity than anything else, a record of an era by a participant, one of the few left to tell the story.” In the succeeding chapters, however, it becomes clear that this memoir is more than just “a record by a participant.” Fulwider’s historicizing and objective posturing often folds under emotional duress: He becomes suddenly angry and embittered toward the people from his past, as if, in remembering, he slips back into the figure of this young and picaresque boy again — too agitated to be soothed by his mother, still too agitated to be soothed by time. This effect, however startling, tends to make Fulwider’s memories feel all the more immediate and alive. Fulwider’s artwork is widely accessible, housed across numerous museums and private collections, as well as viewable online. This document of his (and our) past, and its many reflections in his lasting artwork, together form a rich landscape of local art, life, and history to be explored as a community. For those of us, like myself, who lived in Bloomington many years then moved away, perhaps for just a time, Fulwider’s expression of just how complex it can feel to go home — all at once arousing and boring, illuminating and confusing, painful and effortless — is not easy to forget. The next stop on my pilgrimage was the I C Depot, or rather I should say the site of the Depot, the main structure had been torn down. However, the freight station was still standing and was being used as a “station” by the train crews who had to have someplace for a phone connecting them with the dispatcher, wherever he was. This structure was located on what had been almost the north edge of town, about three blocks nearer than Kenwood, my aunts home. It was between Walnut and College Avenues, very high above the streets with bridges over both. The station perched on a high earthfill made it a dominating structure in the north end of town. Actually, Bloomington is a hilly city and the height of the station was not as noticeable as it might otherwise have been. Unlike the Monon Railroad, this station was quite a ways from downtown. It was as though it had been an afterthought. The I C was late in coming to Bloomington, which necessitated its almost suburban location. Our little I C station was perfection in the art of Railroad Architecture. Never had man so eloquently expressed beauty and function-following-form than in this little jewel. It was beautifully proportioned with balance in the span and design of the corbels supporting the projected roof which extended shelter almost to the tracks. This was repeated in the covered passageway between the passenger depot and the freight station, an integral part of any depot complex. An ornate ramp and cover were provided from the street and parking lot to the elevated depot. 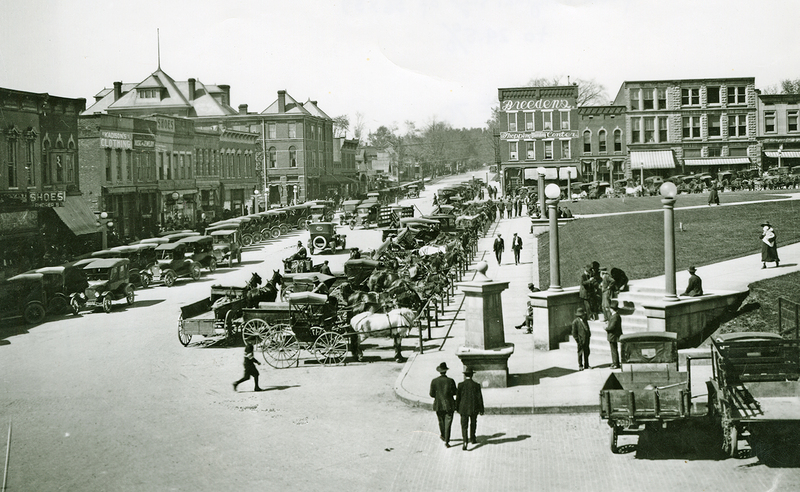 This was all built before the automobile, when parking was no problem except for a few horse drawn cabs and hacks that met the trains each day to take passengers to the various hotels or restaurants. Families met their own passengers with their own rigs, or mostly just walked, a common practice in those days. In the station was the Railway Express office, a unique method of shipping packages too big for the U.S. Mail Parcel Post, but too small for freight. The Express service was fast, just like passenger train service, and very popular. It succumbed later with the passenger train business, and was a tremendous loss of service to mankind. Our depots were great meccas at train time. Anyone free at the moment could go to the station to see who arrived or departed, what the drummers were selling these days, and also the latest news from the big city by word of mouth from the train crew, or the newspapers that came in from the capitol city, copies of which were rushed to the local newspapers for copying into the evening edition. Our other railroad went north and south through town and was called the MONON. 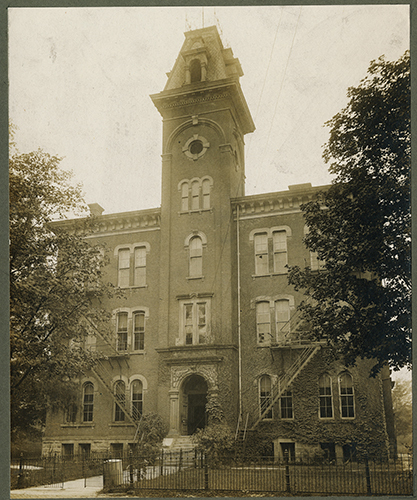 … I watched the Monon from the big victorian windows of Central School, and later when we moved across town I watched the I C from the large plain windows of McCalla School, where I was regarded as just as much an idler as I had been at old Central. We often rode the little morning train to Indianapolis. Mother and Grandma Robertson would go to the city to shop, which usually meant they were taking the day off. I would get mother to write me an excuse so I could go with them and we would leave around nine o’clock on the accommodation train. As I passed near the school, I would walk to the back of the train and lean out the back door and thumb my nose at old Ben Johnson. To a boy growing up with trains in his head, this was a trip of a lifetime. After leaving town it was all new, the railroad unlike the roads, cut right across fields and streams, through barnyards and forests, regardless of property lines. It always took the shortest route even if people had to move over a little bit to accommodate. Unionville was the trains first stop, if it was flagged. If there were no passengers or express the train proceeded. We usually sailed right through and then came the big highlight … we would soon go through the only tunnel on the railroad. I always looked forward to this. I would be standing in the rear vestibule, with only a small folding screen to keep me from falling out the rear door. This screen was only about thirty inches high, just enough to keep a drunk or a child from falling out of the car onto the speeding tracks below. This was standard procedure for small trains without observation cars and though seemingly dangerous, really felt quite secure. I would take my station here as we approached the tunnel which became obvious when we entered a deep cut, then suddenly overhead became dark and we were in the tunnel with the light from the portal rapidly diminishing as it became more distant. This lasted only a short time, the tunnel was not long, maybe three or four city blocks, then we would bust out into daylight, the east portal would rapidly disappear in the distance and we would be back in people’s backyards and hog lots again. However, there was another big thrill to come almost immediately and that was the high Shuffle Creek trestle. 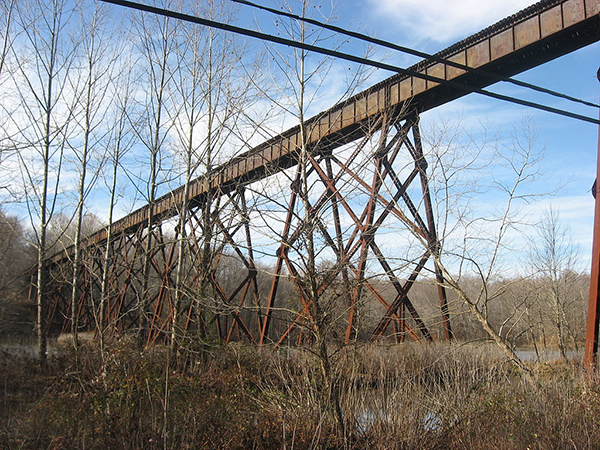 The road had two such high ones, the Richland Creek Trestle near Bloomfield, 157 feet high and 2295 feet long, the highest, and Shuffle Creek 75 feet high a little shorter, both stoutly built of steel and quite spectacular. As we rumbled across this structure the metal wheels on track amplified the sound and the vibrations reverberated throughout the length of the bridge which was about one-fourth mile. After the trestle we soon came to the little settlement called Trevlac, named after the locating engineer for the railroad who’s name was Calvert. Trevlac spelled backwards. Then on to Helmsburg the only railroad stop in Brown County. There was always a modicum of business here because all mail and freight to the Brown County seat had to be brought through this station and then freighted over to Nashville by horse drawn dray. After a few minutes for this exchange we were on our way again. Morgantown, next stop, a large metropolis compared to Helmsburg, but not so big but what you could see both ends of town from the train station. More transactions, then Bargersville from which it was a straight shot to Indianapolis. All other hamlets and villages got their mail by the pick-up arm and hook that snatched it from the moving train. The whole trip was about 47 miles to The Indianapolis Union Station and took about an hour and a half which was regarded as damn fast in those days. The Monon, the railroad that ran by our mill and north and south through our home town, was the subject of great fascination to me as I grew up. Not only did I watch it out the windows of old Central School, but it was constantly in our lives as we heard its laconic whistle in the night and as we observed it on our trek back and forth from school to the mill and home. This was the culmination of the great age of the steam locomotive, the most powerful engines ever devised were just coming into use on the steep grades of the Monon through our town and indeed throughout the southern Indiana route of this fabulous little railroad. We were thrilled each afternoon when the crack passenger train whistled through never stopping. It was a special through-train from New York City to the Spa at French Lick Springs, in southern Indiana. It was operated by the Pennsylvania Railroad and used our little railroad on a trackage agreement for those miles involved from Indianapolis to French Lick. It had no scheduled stops, and consisted of a small Atlantic type locomotive of the typical Pennsylvania Railroad design, with the 4-4-2 wheel arrangement so characteristic of that classification. In addition, a baggage car and one coach that had been cut out of the New York to St. Louis express at Indianapolis. It was the only train allowed to negotiate our streets and crossings at any speed. And though it had slowed considerably, it went through town at what we thought was a thrilling pace, with whistle blaring, steam and coaches trailing behind. The engineer fascinated us with his head out the window and his goggles covering his eyes and looking straight ahead never noticing us little boys that waved frantically as he whizzed by. He knew he was making a thrilling passage and laid it on as thick as he could. This was the moment when we all decided we would be railway engineers when we grew up. Michelle Gottschlich is a poet, freelance writer, and a first year MFA candidate in creative writing at the University of Virginia. She earned a BA in English from Indiana University. Her debut book Void Sets (2015) and chapbook How to Keep Full in February (2016) were published under Monster House Press (Bloomington). Michelle lived and worked in Bloomington for nine years, until August of 2018.